Preheat oven to 220 C. Lightly grease a baking dish (could be a cake tin, individual ramekins or ceramic baking dish). Add the strawberries to prepared dish and sprinkle over half of the sugar (1 Tbsp). Toss to combine. In another bowl combine flour and remaining sugar. Rub in butter until mixture resembles fine breadcrumbs then add the almonds. Sprinkle crumble mixture over the strawberries. 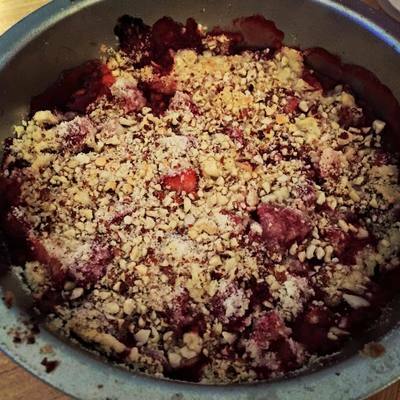 You can also press the dough together and put blobs of it on the strawberries to make it more like a cobbler. I have some left over in the fridge for dessert tomorrow night!